Really interesting stuff. I love it. Reminds me a little of the Memphis debate last year, about how impressive their undefeated run in conference was. I think the handling of injury games could be better, as removing them entirely would probably be viewed as a little extreme, but overall I think this is very informative. "Reminds me a little of the Memphis debate last year, about how impressive their undefeated run in conference was." Indeed, I was thinking of that while I wrote it. Hopefully this one makes me look just as brilliant in the tourney. "I think the handling of injury games could be better, as removing them entirely would probably be viewed as a little extreme"
Reasonable. 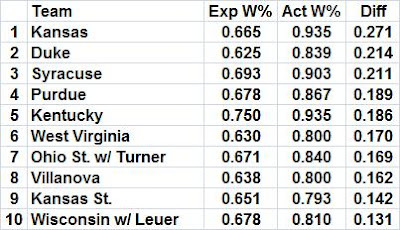 Looking at their overall resumes, Wisconsin comes in 11th (+.114), Ohio St. 13th (+.107), and Michigan St. 15th (+.095). This is why it's hard to be an Illinois fan who also puts great faith in Vegas lines and the Pomeroy Ratings. All year, I've been trying to convince myself that they were better than their Pomeroy Rating, but the last few weeks have put an end to that facade. Anyways, excellent post, and I endorse the results, even if they look bad for my team. how did you obtain the expected winning percentage? I have been trying to replicate your results and have not been successful? It's the same as Pythag for baseball but using 11.5 as the exponent. Yes, I know what the Pythagorean metric is and have read up on Kem Pom's blog. But how did you specifically manipulate the SOS Pythags to obtain the expected winning %? 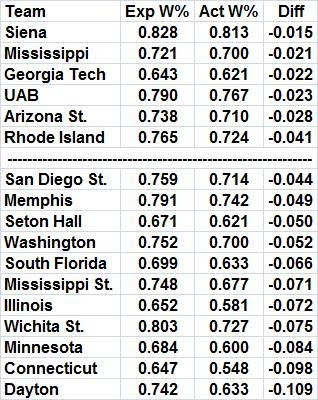 I have a spreadsheet that spits out the expected score of each game according to KenPom. That is what I used. If you email me I can give it to you.